Greater Accra (a prime area) is Ghana’s smallest and most important region. Its capital, Accra, is also the country’s capital and its economic and political centre. Of Accra’s historic and cultural institutons, the best known are the National Museum, which features exhibits on the history of the people of Ghana, and the modern, boat-shaped National Theatre. The architectural styles brought over by Ghana’s colonizers—the Portuguese, the British and the Danish—are prominently featured in the seaside forts now in use as museums and government offices. Accra has the greatest variety of restaurants in Ghana. With most eateries staying open late, it has a bustling nightlife, especially on weekends. Sandy beaches abound in the south. The La Pleasure and Kokrobite beaches are among the most popular in Ghana. Sport and recreational facilities for nearly every sport are available in the city proper and at the beaches. In upscale areas, houses are typically in the colonial style, standing on stilts and with broad verandas and lush gardens. The middle-range residences are usually one-storey concrete houses with galvanized iron roofs surrounded by grass and trees. There are also some concrete apartment buildings in the city’s outskirts. The greater part of Accra’s population live in shanty towns on the outskirts of the city. The Greater Accra region is divided into 6 districts, the most important of which is the Accra Metropolis District. The city of Accra is Ghana’s capital and the centre of commerce and administration. It is also an industrial centre with more than 70% of the region’s manufacturing facilities. One of its landmarks is the former presidential residence: the historic 17th century Christiansborg Castle in Osu. Cultural centres include the Accra Centre for National Culture, the National Museum of Ghana, and the Ghana Academy of Arts and Sciences. Accra is rather congested and humid, but fairly green and leafy. Its public transportation includes a metro with 6 stations as well as buses and taxis. The roads are smooth and well-paved. Osu is a lively commercial centre, as active at night as it is in the daytime. Some Western and Chinese restaurants are found off the main road, while cheap authentic local cuisine is plentiful in its night market, where seafood is grilled on the spot and local corn meal dishes like kenkey and banku are cooked fresh. Along its main road, at the southern end of which stands Christiansborg Castle and a number of embassies, are schools, churches, large supermarkets and shops. Housing ranges from early 20th century low-rise apartments and detached houses to newer buildings. This area is cool, with refreshing sea breezes and shady trees. This is a sparsely populated, upscale residential area not far from Kotoka International Airport. Most of its residents are wealthy and include both locals and foreigners. There are also some offices and embassies here. The Airport Area is quiet, leafy, and cool. Most of the housing consists of refurbished, low-rise colonial-era apartment blocks. There are schools and shops nearby, though goods are often expensive, and there is no public transport available other than minibuses into town. Most residents have their own cars. The roads are quite good and lined with trees. Cantonments is close to the airport and just 5 kilometres east of the city centre. The area is occupied mainly by academics, government officials and upper-middle class residents. It was once slated to be developed into a military housing district by the British, but has instead become a modern planned residential area. Housing consists of upscale, 3- or 4-bedroom detached houses. There are a few schools in the area, including Ghana International School. The police hospital and a few clinics are nearby. Shops and nightlife are lacking, but there is sufficient public transportation in the form of minibuses and taxis. Some new estates are being built in this affluent area. Wealthy locals and foreigners are attracted to East Legon because of its low population density and classy, modern apartment blocks and detached houses. 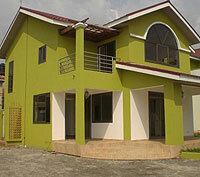 Nearby is Legon, a suburban area which centres on the main campus of the University of Ghana. There is a variety of commercial establishments in East Legon, including the new A&C Shopping Mall, markets, and supermarkets, though prices of groceries tend to be high. There are fitness centres and internet shops, a cinema, and a hotel. The Kotoka International Airport is just a short drive away. Plenty of public transportation to the city centre is available. The area is well-connected to other towns and cities as well. Traffic can be bad in the morning and the evening, however. A more serious problem in this area is rampant petty theft and occasional armed robberies. The residential area of West Legon has a quickly growing population that consists mainly of well-off residents. 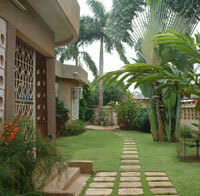 Well-planned and leafy, the Westlands area is attractive to foreigners, especially Lebanese. Most of the housing consists of detached houses with 3 or 4 bedrooms built in the mid-1990s. There is little traffic in the area, though taxis and minibuses ply the main roads and most of the residents have their own cars. The roads are good and there are some offices and schools here. However, there are few shops, few entertainment venues and no nightlife. Abelemkpe is a mixed-income area divided into exclusive New Abelemkpe and the humbler Old Abelemkpe. New Abelemkpe, often called Abelemkpe Forest, is shaded by trees and favoured by affluent people, academics, and foreigners. There are some detached homes here, though housing consists mainly of modern low-rise apartment blocks. Old Abelemkpe is a lower-middle-income neighbourhood. Residents live in compound houses, usually with small outdoor cooking areas in lieu of a kitchen, and a communal bathroom. Abelemkpe is quite tranquil and is oriented to families, with two big parks and several schools, including an Amercian international school. There are some clinics here but only a few offices and businesses. The airport is a 15-minute drive away. Asylum Down and Kokomlemle are middle-income neighbourhoods. The city centre is not far away, but the area has nightlife of its own. However, there are no markets. There are several churches and few mosques. Public transport to and from these areas is efficient enough and traffic is not too bad. Kanda is a middle- to high-income residential area just a few kilometres away from the city centre. There is a mix of old and modern buildings, very little traffic, few shops, little entertainment and nightlife, and no markets. Some embassies, the country’s national broadcasting corporation, and the Accra Zoo are here. The proximity of Osu makes up for what the area lacks. Public transport to the city centre is available. Densely populated Kaneshie is known for its enormous market where women in straw hats sell local produce from morning to evening, and where roadside stalls sell food. 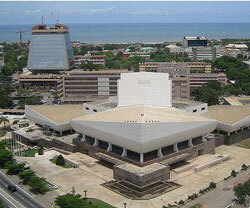 The city’s most important landmark, however, is the palace of the Ga Mantse, or the Ga tribal leader. Kaneshie also has an industrial zone, dominated by plastics factories. Being along one of the main roads out of Accra, Kaneshie has a long-distance bus terminal as well as plenty of local public transport. Traffic is heavy throughout the area all day, especially on the main road and near the market. It can take an hour to get to the city centre from here.